California Chrome Proves Us Right! Our Kentucky Derby Limit still holds. The extent to which natural selection plays a part in the characteristics of a given population is difficult to quantify because it happens in an uncontrolled environment. There is some debate among evolutionists as to the importance of survival of the fittest compared to the importance of survival of the luckiest; but let’s not let that distract us from the issue at hand. Instead, let’s focus on the general agreement (between creationists and evolutionists) that artificial selection (that is, selective breeding) is like natural selection on steroids.Because natural selection has no goal in mind, the path toward the final result takes an inefficient path determined by chance. A breeder, on the other hand, is trying to produce plants or animals with specific characteristics, and only allows those individuals with the desired characteristics to breed, thus reaching the goal in the shortest possible time. Macroevolution is the alleged process by which new kinds of living things arise. It has never been observed, but it is claimed to be the result of the accumulated results of microevolution over a very long period of time. This period of time is too long to observe, which allows evolutionists to state it as fact, without having to produce any experimental proof. Microevolution (that is, artificial selection) has been used to breed improved varieties of many plants and animals which have desired characteristics; but it has never produced a new kind of living thing. Microevolution has never led to macroevolution because macroevolution requires a different process than microevolution uses. Microevolution works by breeding out undesired characteristics. Macroevolution requires the addition of new desired characteristics. Macroevolution is not just an accumulation of lots of microevolution. Microevolution is as different from macroevolution as subtraction is from addition. You can’t add new genetic information to DNA by taking away genes. In that article, we noted that the Kentucky Derby is the best known, best controlled, longest running breeding experiment still being conducted. Every year since 1896, horses of the same age have run the same distance on the same course at the same time of year (the first Saturday in May), and the results have been carefully documented. Breeders have invested substantial time and money trying to breed the fastest horse and win the race. If artificial selection could continue to improve the speed of racehorses without limit, then the winning times would get shorter every year—but they don’t. 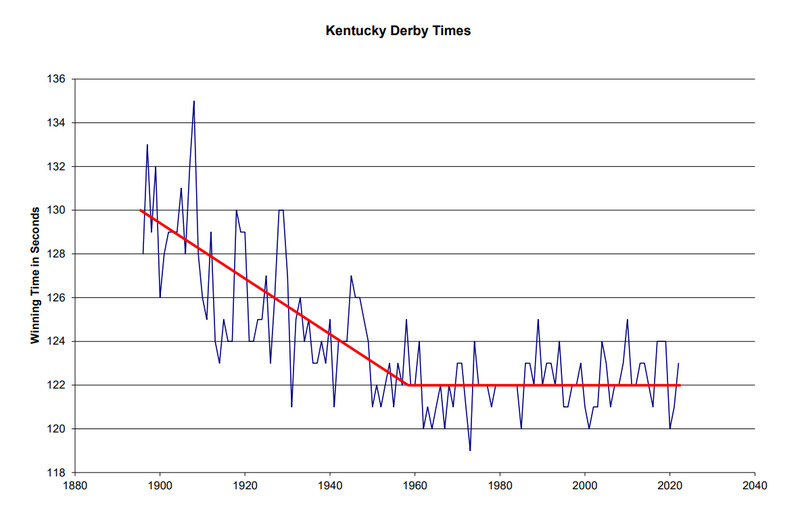 Fifteen years ago, we wrote that the “Kentucky Derby Limit” had been reached in 1960, and that times would not significantly improve in the future. We were right. If the evolutionary limit had not been reached in 1960, and horses had continued to evolve at the rate they had been evolving for the first 60 years of the Kentucky Derby, an extrapolation of the data shows that the winning time this year would have been about 114 seconds. California Chrome would have lost by more than a football field to that hypothetical horse. Every year, for the past 15 years, we have updated the on-line version of our June, 1999, article to add one more data point to the table of Derby winners, and add one data point to the graph of those winning times. We have not needed to change anything else in that article because everything else we wrote then is still true today. There is a limit to how much variation (natural or artificial) selection can produce. It is a scientific fact that proves the theory of evolution is false.